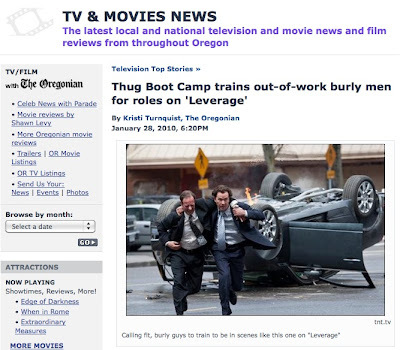 Home | Blog | Thug Boot Camp trains out-of-work burly men for roles on "Leverage"
Thug Boot Camp trains out-of-work burly men for roles on "Leverage"
UPDATE: EARLY REGISTRATION DISCOUNT EXTENDED TO FEB 4! There’s high demand, Veenker says, for men with martial arts and military backgrounds, ethnic diversity and athletic, burly or muscular builds. The Thug Boot Camp is intended to train guys with these characteristics to deliver a few lines and handle uncomplicated fight scenes. The two-day session lasts 16 hours and includes participation in classes, Q&As, a behind-the-scenes session, networking and live teleconference with members of the “Leverage” team. Thanks to the Oregonian and Kristi Turnquist for the plug!